In Greek mythology, the Argonauts were a band of heroes who sailed with Jason in his quest for the Golden Fleece*. Their journey took them through numerous adventures and required the help of many different gods. Among the Argonauts were the sons of kings and of gods. According to some sources, one of the Argonauts was a woman, the huntress Atalanta. Jason was the son of Aeson, the rightful king of Iolcus. When Aeson was overthrown by his brother Pelias, he sent Jason to be raised by the wise centaur Chiron. Later Jason returned to Iolcus to claim the throne. Pelias agreed to give it to him if he first found and brought back the Golden Fleece from Colchis—which Pelias knew to be an almost impossible task. The Golden Fleece was the hide of a golden ram sent by the gods to save Phrixus and Helle, two royal children of the land of Iolcus whose lives were threatened by their stepmother. As the ram carried them to safety, Helle fell into the sea and drowned. The area where she fell (the Dardanelles in present-day Turkey) became known as Hellespont. Phrixus reached Colchis safely. There he sacrificed the ram to the goddess Hera*, his protector. The fleece was hung on a tree in a sacred grove and guarded by a serpent that never slept. The Call for Heroes. Jason ordered a ship, the Argo, to be built and sent messengers throughout Greece asking others to join him in his quest for the Golden Fleece. After assembling a group of 50 heroes, Jason set off. The Argonauts' first adventure was on the island of Lemnos, which was populated only by women. As a result of a dispute between husbands and wives, the women had killed all the men. The women received the Argonauts with great hospitality, and the heroes began to forget their quest. One of the Argonauts stood firm, however. This was Hercules (Heracles)*, a hero known for his strength. Hercules persuaded the other Argonauts to return to the ship. In another adventure, Hercules defended the ship against six-armed giants who attacked while the others were on land. Later, in a rowing contest, Hercules broke his oar. While cutting wood for a new oar, his squire was kidnapped by a water nymph. Hercules went in search of the boy and, eventually, was left behind by the Argonauts. When the heroes stopped at the land of the Bebryces, the king, Amycus, challenged them—as he did all visitors—to a fight to the death. Pollux, the son of Zeus*, took up the challenge and killed Amycus. The Argonauts then stopped to see Phineus, the blind king of Thynia. Phineus was a prophet, and the travelers needed advice on how to proceed. Phineus agreed to help them if they would rid him of the Harpies, fierce, part-woman, part-bird creatures who stole and spoiled his food. Jason ordered a feast to be prepared. When the Harpies arrived to ruin the feast, two of the Argonauts—Calais and Zetes (winged sons of Boreas, the North Wind)—pursued them. Eventually, Zeus sent a message that the Harpies should be spared but that they should leave Phineus in peace. and watched its course as it flew between the rocks. The dove made the passage, losing only a single tail feather. As soon as the rocks began to come apart, the Argonauts pulled hard on their oars, following the path of the dove. When they had almost passed through, a great wave held them back. At that point, the goddesses Athena* and Hera gave them a push, and the ship made it to safety. Forever after, the Symplegades remained separated. Help from Medea. After more adventures, the Argonauts finally reached Colchis. Jason and several companions went to the court of King Aeëtes to request the Golden Fleece. The first to see Jason was Medea, the king's daughter. Aphrodite (Venus), the goddess of love, made her fall in love with Jason. Medea was a witch and could help him with the difficulties ahead. Aeëtes had no intention of handing over the Golden Fleece, but he pretended to agree if Jason could pass several trials. Jason was to yoke two fire-breathing bulls to a plow and sow a field with dragon's teeth. The teeth would yield armed men whom Jason would then have to kill. Medea gave Jason a magic ointment that he rubbed on himself to protect him from the fiery bulls. Next she told Jason to throw a boulder in the midst of the soldiers to confuse them and make them fight one another. Then he would have to fight only the survivors. Following her directions, Jason succeeded in defeating the warriors. Aeëtes told Jason he would hand over the Fleece the next day, but Jason and Medea did not believe him. Promising to marry her, Jason once again obtained Medea's help. That night, she led him to the sacred grove and put the serpent to sleep with her magic. Jason then took the Fleece and with Medea and the Argonauts set sail across the Black Sea. Accounts of the Argonauts' journey home vary. 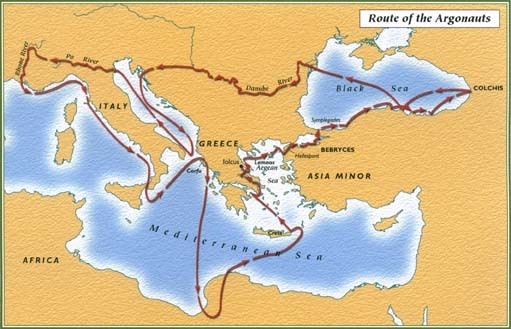 According to the writer Apollonius, Medea's brother Apsyrtus blocked the mouth of the Black Sea so the Argonauts had to find a different route for returning to Iolcus. Several versions of the legend agree that the heroes crossed the Black Sea to the Danube River. After sailing up the Danube, they traveled along various rivers and seas before reaching the Mediterranean Sea. Some sources say that the Argonauts went north to the Baltic Sea; others relate that they followed the Rhine River to the Atlantic Ocean or that they reached the Adriatic Sea. At the entrance to the Adriatic, they met Apsyrtus, who tried to convince Jason to give up Medea. Jason refused and killed Apsyrtus. The Argonauts sailed up the Po River and down the Rhone. Having almost reached Greece, the Argo was blown off course to Libya. There a great wave stranded the crew in the desert. On the advice of the gods, the Argonauts carried the ship across the desert until the sea god Triton helped them launch it back on the Mediterranean. As they sailed past the island of Crete, Talos, the bronze man appointed by King Minos to protect the island, threw rocks at the Argonauts. Medea killed Talos with her witchcraft. The Argonauts' adventures continued. Nearing Greece, the ship was enveloped in a darkness so great that they lost their way. Apollo* sent a blazing arrow that showed them the way to an island where they could wait until the light returned. At last, the Argo arrived home in Iolcus. The Argonauts were held in great honor throughout Greece, and many noble families later claimed to be descended from them. Jason presented the Golden Fleece to Pelias, but he never became king. Jason's ship, the Argo, was made from the wood of a sacred oak and had the ability to think, to speak, and even to prophesy. The ship had one oar for each of the Argonauts, who rowed themselves to their adventures. When it was first built, the Argo refused to descend to the sea until the musician Orpheus sang to it and played his lyre. During the quest, the ship traveled under the protection of Athena and Apollo. Afterward, the Argo was dedicated to Poseidon* and placed near his temple in Corinth. Eventually, the gods turned the ship into a constellation in the sky. Many writers have been inspired by the subject of the Argonauts and the quest for the Golden Fleece. Among the ancient Greek works are Pindar's Pythian Ode, Apollonius Rhodius's epic Argonautica, and Euripedes' play Medea. The Roman poet Ovid mentioned the Argonauts in the Metamorphoses. In the Middle Ages, Chaucer retold the story in the Legend of Good Women, and in the 1800s, William Morris wrote a long narrative poem Life and Death of Jason. Robert Graves's novel Heracles, My Shipmate was published in 1944. See also Atalanta ; Harpies ; Hera ; Hercules ; Jason ; Medea . This article is a lot of help to young teenagers learning about Greek myths and is a very detailed yet easy-to-read page.